New research from Yale University shows that the protein known as Nlrp6 plays a key role in the overall immune response that provides immediate defense against infection. The gut is an important barrier for the body, protecting it from pathogens that might otherwise cause illness. While scientists have investigated the intestinal immune response to bacterial invaders, the response to viruses is not well understood. In a study published in Science, Yale researchers describe how the gut recognizes and controls viruses. The Yale-led team focused on a protein known as Nlrp6, which plays a key role in the innate immune system — a part of the overall immune response that provides immediate defense against infection. They infected normal mice and mice deficient in Nlrp6 with a virus that causes intestinal infections. 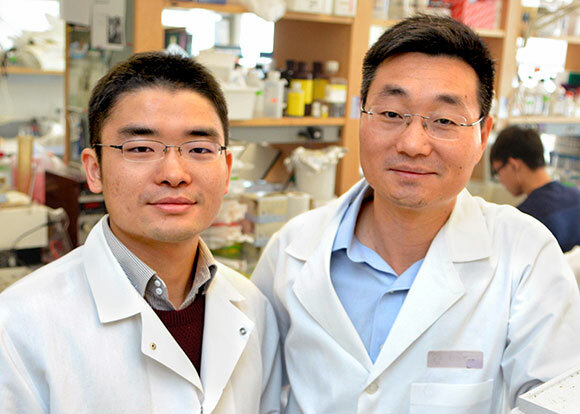 “We found that the virus replicates more robustly in Nlrp6-deficient mice,” said Penghua Wang and Shu Zhu, co-lead authors of the study. They observed a similar result when they infected mice with norovirus, a common cause of viral gastroenteritis. “This molecule, Nlrp6, is involved in how our gut recognizes and controls certain viruses,” said Dr. Erol Fikrig, senior author and section chief of infectious diseases at Yale School of Medicine. In conjunction with other molecules, Nlrp6 is a key component in the pathway that leads to an effective antiviral immune response. Be the first to comment on "Yale Study Shows Nlrp6 Regulates Intestinal Antiviral Innate Immunity"